The witches are chanting their “recipes”, and their cooking forms a contrast with the royal banquet from3.4. 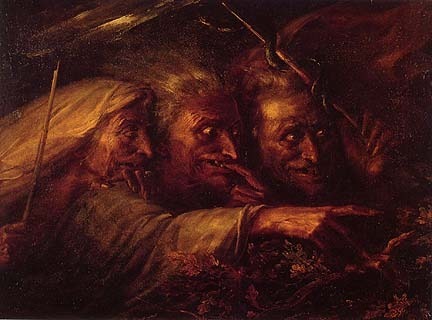 The Second Witch utters the immortal line“Something wicked this way comes”, and sure enough, Macbeth arrives, demanding answers from the witches. They give him three, via apparitions. The first is simply “beware Macduff”; the second, that “None of woman born / shall harm Macbeth”. Macbeth decides to have Macduff killed, just in case. He’s then told that he won’t be “vanquish’d” until“great Birnham wood” marched to high Dunsinane Hill, which sounds as safe as not having to fear anyone who was born from a woman. Macbeth is warned not to ask any more questions, but he does anyway: he’s desperate to know if Banquo’s children will ever be Kings. The witches reveal a procession of eight kings, the last holding a mirror to reveal even more. The witches taunt him for his reaction, then disappear. Lennox arrives with the news that Macduff has fled to England, probably to raise an army to fight Macbeth. There’s a transformative moment in Macbeth, where he throws all morality out of the window, and decides to murder all of Macduff’s innocent family. For a look at the historical Macbeth, see this article. See one adaptation of this famous scene in the video clip below.